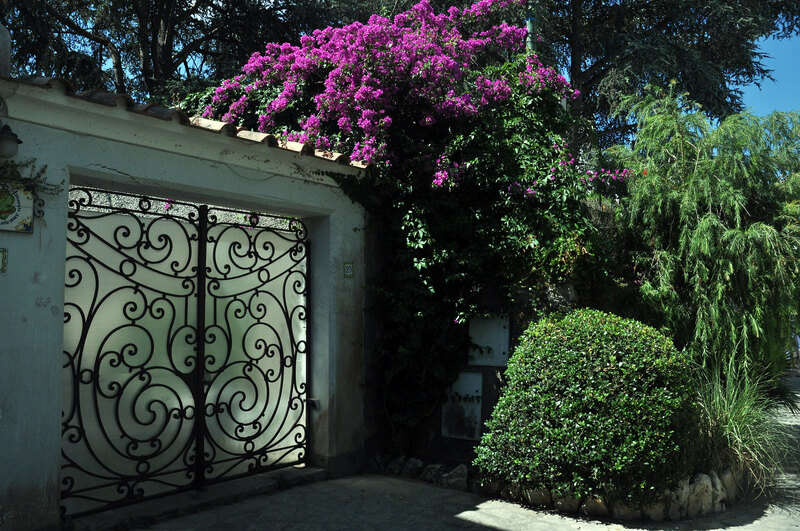 So, even during the two years that I lived in Italy, plus the 5 years I’ve been coming back to visit, I never actually made it onto the island of Capri. 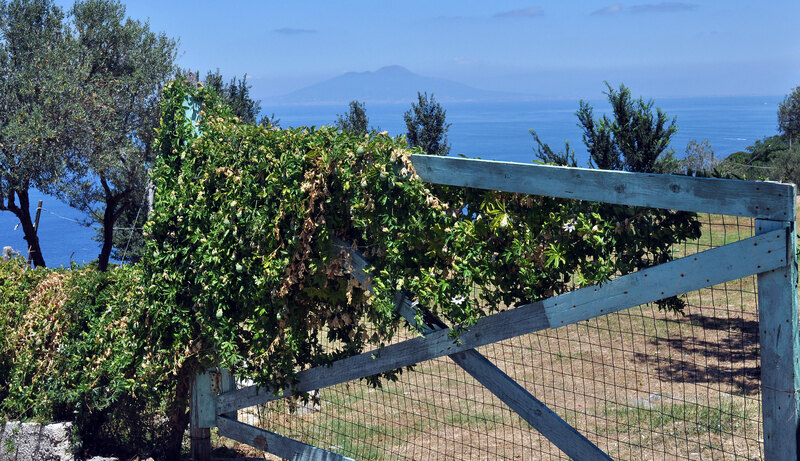 I’ve visited Ischia many times and they are very similar places, but this go around I told my Dad I really wanted to see Capri. So we saw Capri. We got up bright and early (ahem, 5 AM early) and schlepped it to the ALI bus (and by schlep I mean a brisk 4-5 minute walk, quite painless, actually), a bus that runs every 30 minutes from Naples airport to the port of Napoli. At the port, we bought our tickets for the Hydrofoil, a fancy pants ferry that apparently skims the surface of the water? DON’T KNOW. It’s what we take to Ischia, too, and I just don’t ask questions. It’s about a 45 minute ride. Once you get to the port at Capri, you can mingle there (take a boat to the blue grotto from here, if that’s something you’re interested in. We weren’t. Or we were cheap. Same difference.) 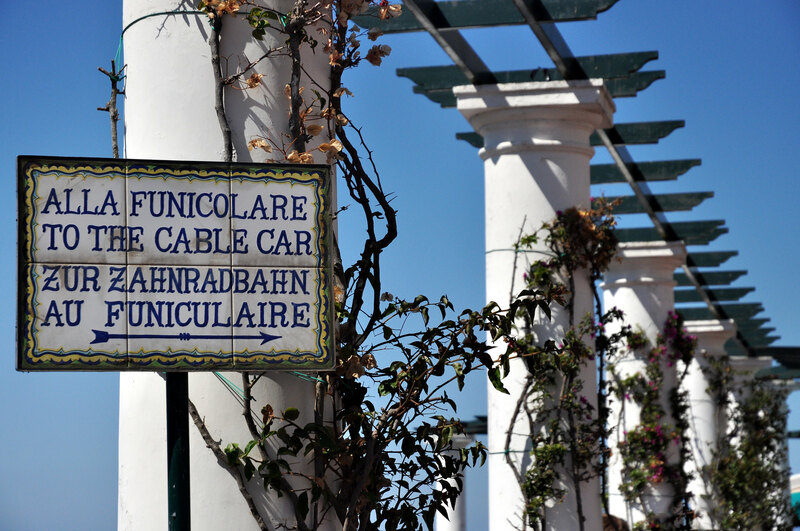 If you don’t want to hang out at the port, (most peeps don’t) you’ll take the Funicolare up to the actual town of Capri. 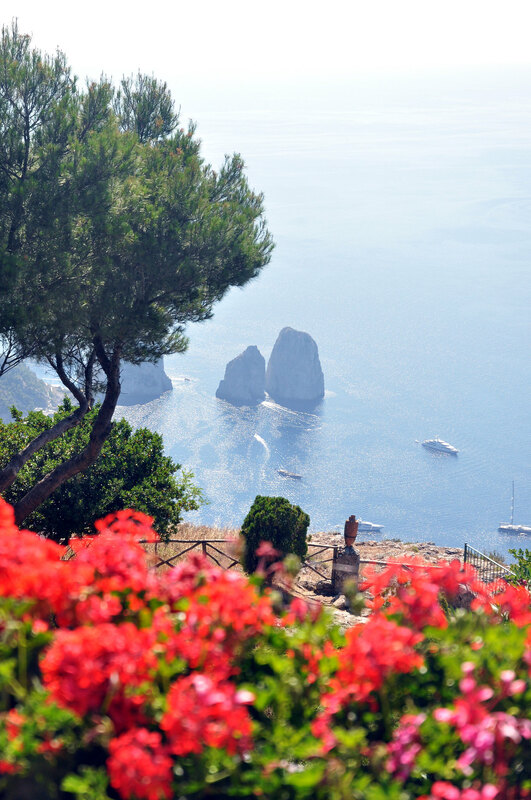 Yea, the island is named Capri and there is a town on the island of Capri named Capri. Like how there’s a New York City in New York State, etc. I guess it’s not that unusual. Anyway, if you’ve never been on a Funicolare before, it’s like a train, but a train made out of stairs that just runs pretty much straight up and down a hillside. From here (Capri) we took a bus to Anacapri (a town higher up the hillside). 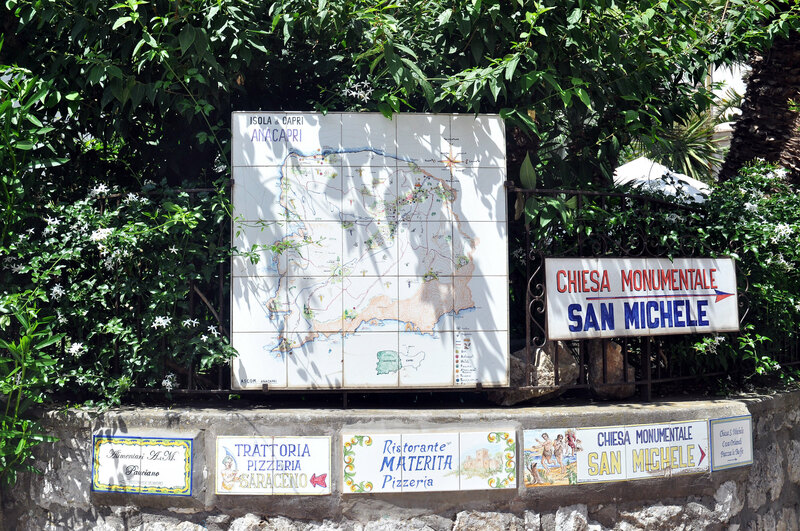 This is where the chair lift runs up to the tippy top of the island, and also where the bustling tourist district is – street vendors galore. 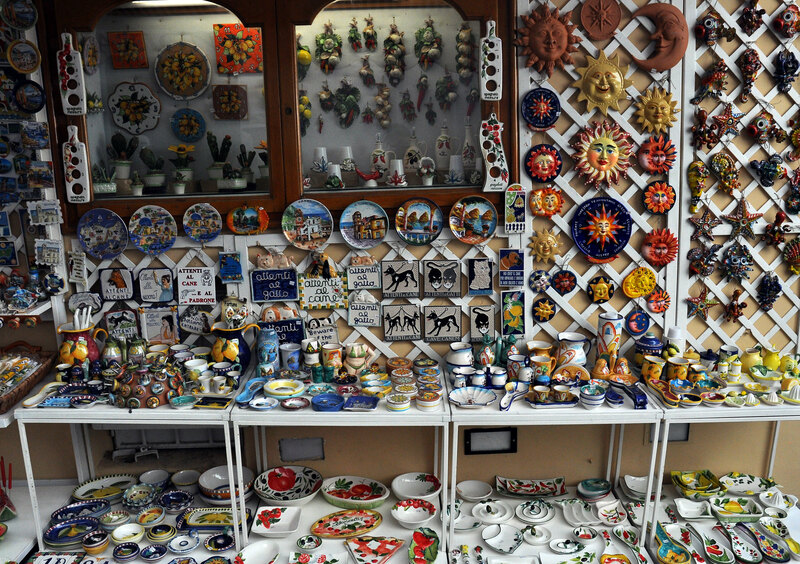 If you’re looking for a souvenir, this is where to buy it. Hand-painted ceramics are not exactly my “thing.” My home decor has a more, “Bed Bath & Beyond Clearance Sale” vibe than unique Italian collectibles. Although I did end up buying a cat magnet because you can never have enough tacky. Anyway. 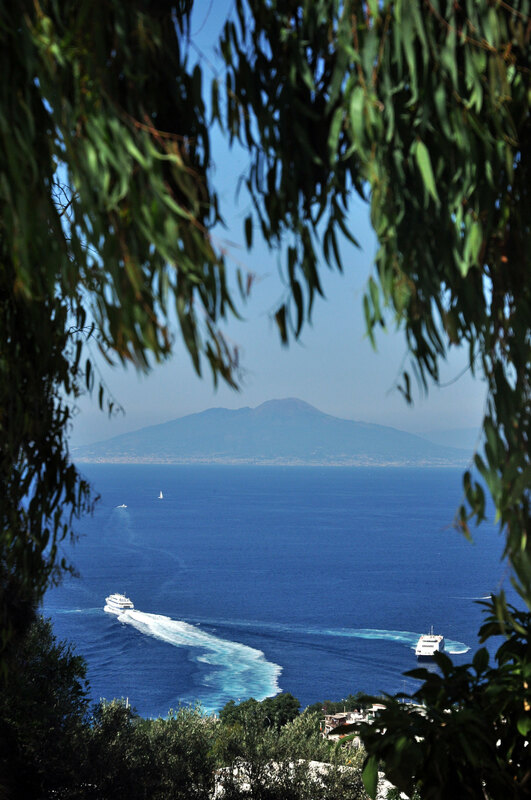 A walk around Anacapri also affords you some spectacular views across the water with Vesuvius looming in the distance. 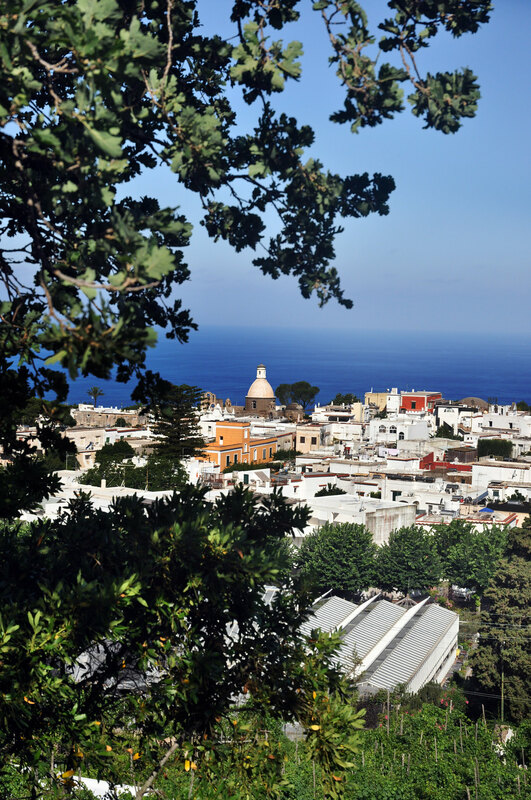 My Dad and I spent quite a bit of time up at the top of Anacapri. 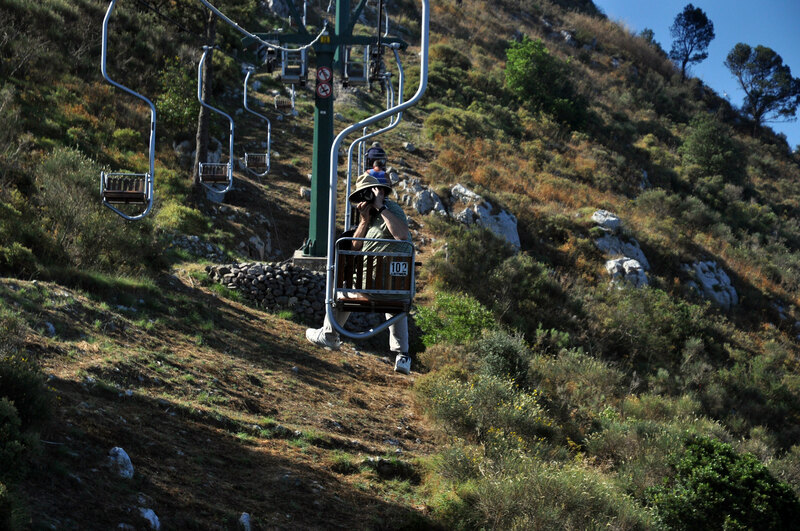 I think we were the first people to ride the chair lift up on Friday morning, it was before 10 AM. The ride up on the chair lift takes about 15 minutes. I didn’t time it, so I’m guesstimating. It’s really a pleasant little ride, you weave between a channel of trees and get some great views out over the town and water. 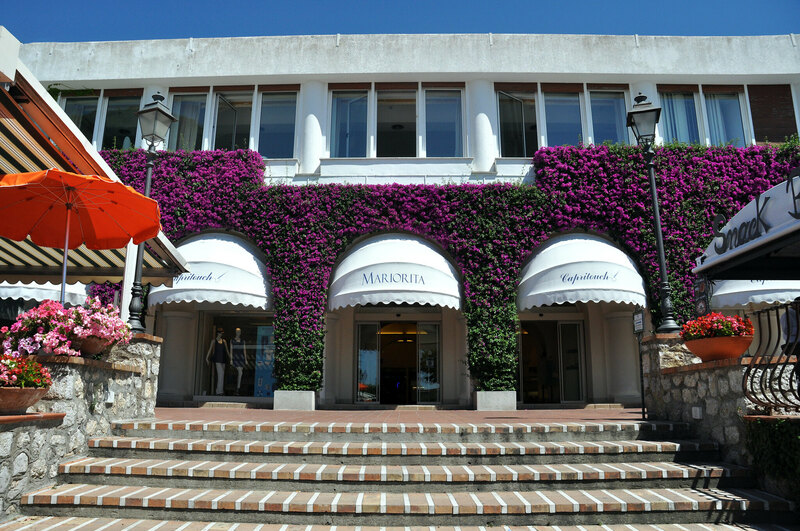 After making our way back down to the town of Anacapri, we wandered around the market for a while before finding a nice spot to eat lunch. After lunch, we started strolling again, this time a little bit off the beaten path into the middle of nowhere. 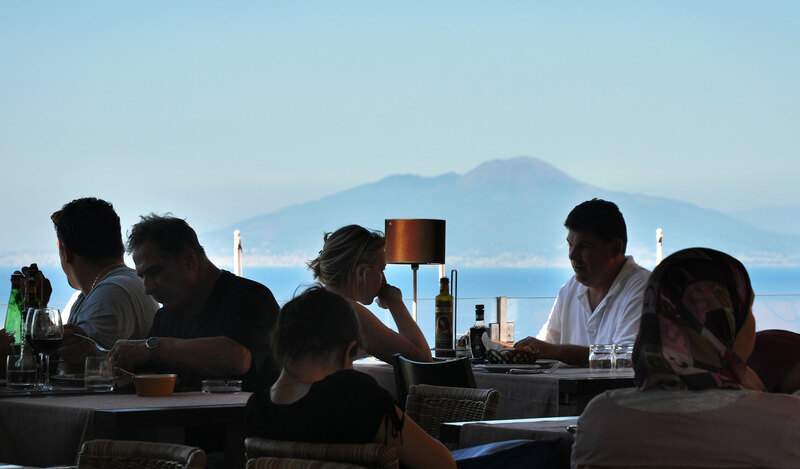 The island of Capri itself is a fairly popular tourist destination, but the foreigners tend to congregate in one or two central locations. A quick adventure away from the throngs of tourists seemed like a great idea. What started off as a leisurely walk around the ritzier area of Anacapri quickly turned into a heat stroke waiting to happen. The roads, which were hilly to begin with, suddenly transformed into very steep inclines. I got it in my head that we could walk down to the shoreline and possibly glimpse the blue grotto. GREAT IDEA #1. We ended up getting lost in the maze of an Italian neighborhood, which really just translates into steep, humid alleyways, one after the other, hot cobble stones underfoot and mopeds zipping by. We passed an elderly man splitting wood (uh, what? 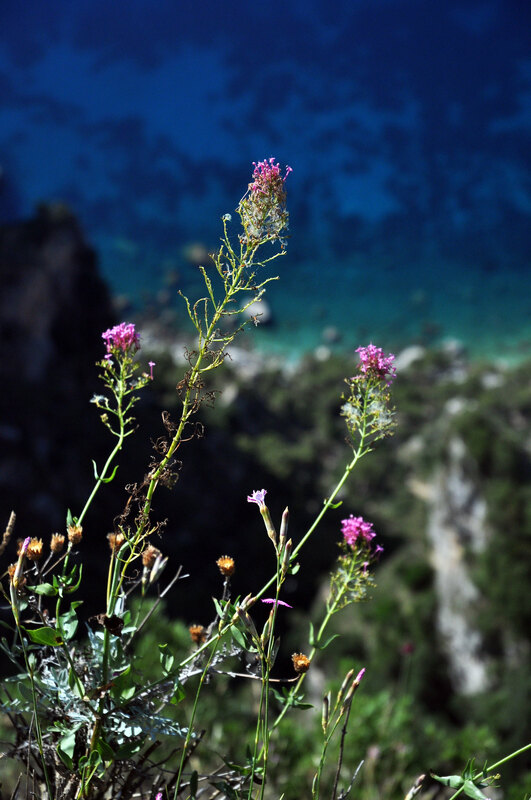 It’s the middle of summer) and in broken Italian asked him if we could reach the blue grotto via the road we were on. We half way understood his answer and decided to trek onward…er, downward? GREAT IDEA #2. We walked down a road, the steepest one yet, and eventually came to a dead end, still mighty high above the ocean and nowhere near our intended goal. My Dad noticed a rock stairwell (or what used to be a rock stairwell) going down the hillside in front of us, so we thought that might have been what the old man was telling us. It turned out to be treacherous and not exactly what two tourists out for an afternoon adventure were looking for, so we made the disheartening decision to turn around, and walk all the way back up what we had just come down. And I’ll admit right now this was all my fault. The upside to this was seeing part of the island that not many tourists get to see, and it was most definitely very beautiful. We made it back to the tourist district, dripping with sweat. I was so hot. I was the kind of hot that makes me feel like I’ll never not be hot. So hot that I forgot what it’s like to be cool – remind me what the sensation of cold water on my skin feels like? That kind of hot. It was miserable. Suffice it to say, we sidled up at a cafe and got gelato. Love,love, love the pictures and you sharing your adventure with your dad. Please, please, please take you Mother-n-law with you next time. I will promise to be good and do everything you say. You make me want to see everything you have seen and go everywhere you have gone. What an awesome opportunity for you. JK about going with you next time, well not really. Hurry home, Mike really misses you. He says he is bored. So bored he took me to my Dr. appt this morning, but I enjoyed every minute of it. Thanks for the tour. Beautiful Anna!! I'm with Mom…I want a tour:) Looks like it was a wonderful day with your dad! Hope you're having a blast!! Do you speak Italian? Beautiful pictures!! I love all these photos! Capris looks so lovely and perfect (ok, maybe without the heat it'd be perfect). Looks like you're having a great trip!